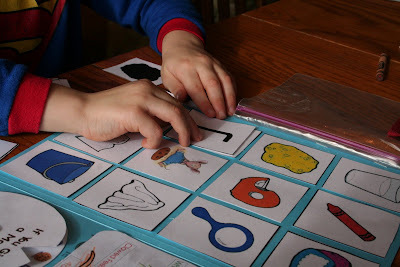 Last week we had so much fun with our lapbook, that we decided to another one this week. 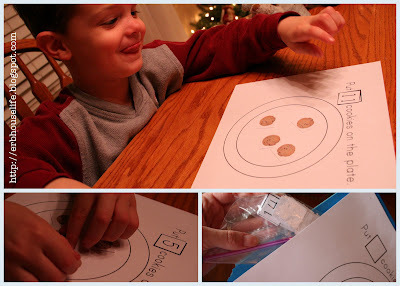 This week I'll be sharing about our preschool fun studying the letter "M" and at the end of the post you will find Mr. Linky so that you can participate too in the fun by sharing what you've been doing during your preschool time. I pulled out several books this week that we were going to read and asked Zachary which one he wanted to focus on, and he chose If You Give a Mouse a Cookie. I pulled together resources from several different sites and we had fun making another lapbook together based on that book. We did do a few activities that weren't related to the book, but it's all listed below, so enjoy looking around. I've provided links to the various activities and sites that we used, whenever possible. 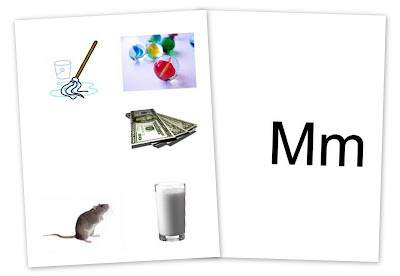 The alphabet book page for the letter "M" was a little grey mouse and his cookie. Zachary cut his pieces out after I traced them for him and then added dots to his cookie - because that's what mice eat, right? I found some cards that have upper and lowercase letter matching on them on this site. The cards are a jpeg/gif image so you can make them whatever size you would like. I pulled all the images together from her site and made a document. I would be happy to email you the full document if you would like. Just leave a comment requesting it or email me and I'll get it to you! I found a fun game that uses similar images to the ones in the book and then has a shadow image of it to put match. I cut apart all the images and we used one side of the lapbook to glue the game pieces and I stapled a baggie to the side to store the game pieces. You can find the shadow match game here (it is also in the document that I put together). 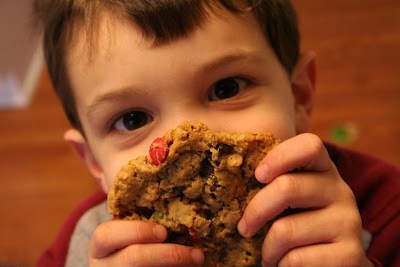 Since we read all about cookies we had to make some to eat too, so we made Monster Cookies. The majority of the lapbook pieces that I printed off were from Homeschool Share and their mini books for If You Give a Mouse a Cookie. I used a full size folder for this lapbook and glued some of the game pieces directly onto the folder so that we could open it up and play it. On the back of the lapbook I glued our math game (only three sides) so that the pieces to the game can slide down in between the game board and the lapbook cover. You can see in one of the pictures above if you can't visualize it. I Spy: While we read through the book, we played "I Spy" and tried to find anything that was shaped like a circle in the book and then wrote it down in our mini book. Mouse Anatomy: Since we're talking about mice we also did a mini book that shows different parts of a mouse: tail, hairless ears, clawed feet and whiskers. Shadow Matching: This game wasn't from Homeschool Share, but I cut the board pieces apart and glued them onto one of the inside pieces of the lapbook. You can find the shadow game here or email me and I'll send you the document I made that includes it. "If you give a boy a cookie he would just eat it and go outside and play. If he put a magical hat on it to come alive he could take it outside to play." Storywheel: This is a wheel that helps retell the story using pictures. I printed it off on cardstock to make it a little more sturdy. 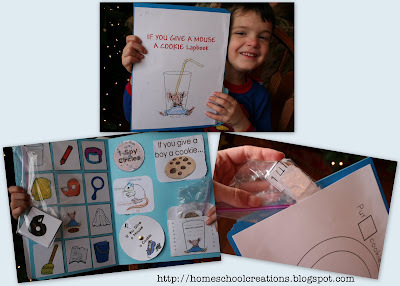 We used a cookie counting game that tied into If You Give a Mouse a Cookie and glued it to the back of our lapbook so we could keep it handy. The game has numbers from 1-20 and you can fill in the blank that tells you how many cookies to put on the plate. The Preschool Corner is a place for us to share the ideas we are using during our "preschool time" with our kids. You can join in the fun and record what you are doing in your house. Publish a post on your blog and link directly here. Then be sure to link to the blog carnival on this post so other bloggers can stop by to visit you. Share what you've been doing in your house this week! (Clementia, can you either email me directly or let me know how to get ahold of you? I can't find a way to comment on your blog. Thanks!). this sounds like such a fun week. maybe we will try some of the activites after christmas. you are amazing jolanthe. i dont know how you find the time to caome up with the ideas, then teach it, THEN put it all together on your blog for us to see/do. thanks for all your hard work. Mmm, the cookie looks yummy! I love the mouse and cookie theme you followed. The lapbook ideas are marvelous! The story prompt mini book was a great addition. I love big imaginations of little ones! What a fun week you have had! IF you give a JO a cookie...SHE WILL FIND A HAIR IN IT!!!!!!!!!!!!!! That is a very cute and full of learning lapbook! I was wondering what the pocket in the corner is? Is it an alphabet pocket?